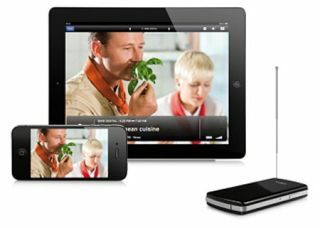 Watch live TV on your smartphone or tablet with Humax receiver | What Hi-Fi? The Tivizen DVB-T Wi-Fi receiver transmits Freeview TV directly to your portable device, allowing you to watch your favourite programmes on the go. All you need to do is download the Tivizen app in order to pair up the devices over WiFi, once done you don't need a 3G or WiFi connection to get it working - just a solid digital TV connection. The device delivers 3.5 hours of battery life, or you can leave it plugged in on charge via the mini-USB adaptor for longer viewing sessions. The compact receiver weighs just 70 grams, so it's easy to take out with you to the park or the beach. The Tivizen DVB-T Wi-Fi receiver is also available to use in a number of European countries, such as Austria, France, Germany, Spain and Italy, so you can take it on holiday too. The Tivizen DVB-T Wi-Fi receiver is available now from Humax Direct and is priced at £99.95.